Between 14 and 18 May, PRI, and project partner Foundation for Human Rights Initiative (FHRI), brought 14 parliamentarians to London and Brussels for a high-level study visit on the progressive abolition of the death penalty. The MPs were selected because they have demonstrated political leadership in promoting abolition of death penalty, criminal justice reforms or upholding of human rights in their respective countries: Belarus, Jordan, Kazakhstan, Kenya, Morocco, Tajikistan, Tanzania, Tunisia, and Uganda. The aim of the study visit was to enable parliamentarians to make contact, and share experiences and lessons-learned, with other progressive MPs from both retentionist and abolitionist states on how to progressively reduce and restrict the application of the death penalty in practice. It also provided an opportunity for parliamentarians to identify key strategies and tools that can be employed in their own country in working towards abolition and broader criminal justice reforms. 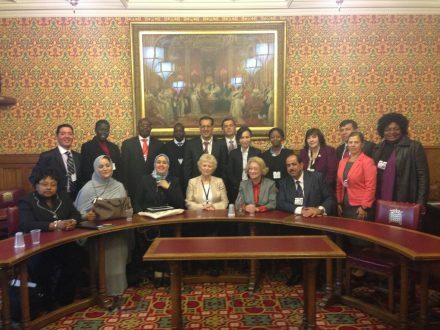 During the visit, the MPs met with members of the UK’s All Party Parliamentary Group for the Abolition of the Death Penalty in the House of Lords, chaired by PRI’s Honorary President Baroness Vivien Stern; the Subcommittee on Human Rights (DROI) at the European Parliament in Brussels, chaired by Hon. Barbara Lochbihler; and at the Belgium Parliament, hosted by Hon. Bruno Tuybens. During these meetings, the delegates were able to engage in bilateral exchanges with their counterparts on their experiences of working towards abolition. Some of the key topics discussed included the use of the death penalty for acts of terrorism, how to deal with vigilantism, the death penalty as a tool for revenge, how to support national parliamentary networks, how to deal with public opinion on the abolitionist process, and how to strengthen political will. The delegates also attended meetings with the UK’s Foreign & Commonwealth Office to discuss the UK’s Strategy on the Death Penalty, and with the EU’s External Action Service to discuss the EU Guidelines on the Death Penalty. Delegates visited HM Prison Brixton, and attended a meeting with the Ministry of Justice’s National Offender Management Service (NOMS) to learn more about how to the UK deals with its most serious offenders in a post-death penalty environment, effectively on how to implement life and long-term sentences that are fair, proportionate and respect international human rights standards. All 14 participants found the Study Visit informative and useful, and hoped that this would be the start of better coordination among all the different national and regional parliamentary networks working on abolition. Even with the various language barriers (Arabic, English, French and Russian), the group were able to communicate openly and frankly in a friendly and informal manner. The delegates all identified very similar concerns including the need to engage in further advocacy work at both the government and public level, the need to empower more grass-roots civil society organisations, as well as build the capacity of more like-minded MPs to strengthen political will. All delegates committed themselves to taking a stronger political lead in their own countries on the abolitionist agenda on their return. Following the study visit, PRI and FHRI aims to continue working with the parliamentarians from each of the project countries to build on the momentum gained during the visit. In the first instance, PRI will support and encourage parliamentarians to attend the World Congress against the Death Penalty in Madrid on 12-15 June 2013, and attend the roundtable dedicated to parliamentary networks. In the longer-term, PRI and FHRI aim to establish parliamentary taskforces in each of the project countries to work on identifying legislative and policy amendments that will progressively restrict the application of the death penalty, leading to its eventual abolition, as well as identifying an appropriate alternative sanction that can eventually replace the death penalty. PRI will provide technical, logistical and financial support to establish these taskforces, and link them up with other parliamentary groups working on the death penalty. The Study Visit was organised with the financial assistance of the European Union (EU) through the European Instrument for Democracy and Human Rights (EIDHR), the British Embassy in Astana. The content and outcomes of the Study Visit are the sole responsibility of PRI and FHRI and can in no circumstances be regarded as reflecting the position of the EU or the British government.